The Lantzville Art Gallery‘s new show “It’s a Miniature World” opens this week! The show will feature the artworks of several Vancouver Island artists, as well as 10 new miniature paintings I’ve just completed with a focus on local island landscape. Please click on the link if you’d like more information. The show runs from Oct. 19th – Nov. 20th at the Lantzville Art Gallery, located at 7217 Lantzville Rd., just north of Nanaimo on Vancouver Island. Opening hours are Wednesday to Saturday, 11am – 4pm. I came across these little Italian frames in an antique store recently and painted two tiny miniatures to fit them. The minis are painted on hardboard and displayed without glass, which I think suits the time-worn look of the these lovely little frames. Now to find more little gems! “Country Days I & II” acrylic on hardboard. Both minis are 1.5 x 2 inches small. Travelling along the coast of the Olympic Peninsula afforded many beautiful beach moments, and this miniature painting was the result of one such moment, which I enjoyed with my daughters. An adventure in green and a new miniature painting. 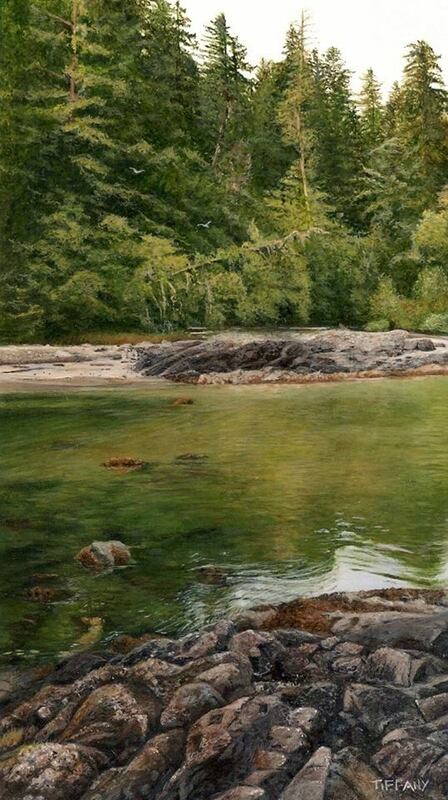 This miniature painting was inspired by a trip to the west coast near Tofino, last autumn. Standing on the rocks and enjoying the lush greens of the coast, I couldn’t help but marvel at the vast array of greens found in just this one beautiful spot on the beach.